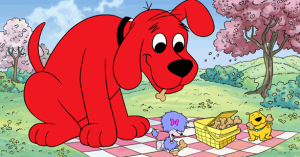 Who remembers Clifford the Big Red Dog™? It’s in its 12th season on PBS Kids and is definitely a classic with more than 126 million books in print from Scholastic. 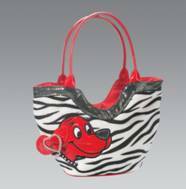 What’s exciting is Clifford’s new fashion collection from plush toy maker and lifestyle gift creator, Douglas Company. The collection is six new pieces, which include Clifford Zebra Tote, Clifford Zebra Clutch, Clifford Zebra Whatever Sak™, Clifford Pink Leopard Clutch, Clifford Pink Leopard Satchel and Clifford Pink Leopard Whatever Sak™. So chic. These will be available for purchase on store shelves in September 2012. Just note the Clifford Fashion and Clifford Cuddle Toy lines are sold at specialty toy and gift stores in the USA and Canada. 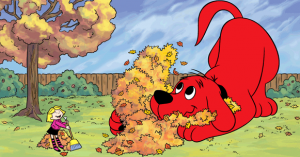 ‘Like’ Clifford the Big Red Dog on Facebook! If you’d like more information on Douglas Co. check out their Facebook & Twitter. The Clutch is the perfect grab and go wristlet at 8.5” by 4.5”. It comes in both zebra print and pink leopard. Clifford’s profile is prominently displayed on the bag’s front, adorned with a glittery collar and a rhinestone heart shape on Clifford’s three dimensional ear. The bag has a swinging wrist strap and zipper closure for secure carrying. SRP: $13 each. The Whatever Sak™ also comes in both zebra print and pink leopard. This uniquely shaped 6” wide by 5” tall cylinder style bag has a zipper that goes around the top. Beneath the zipper closure is a very cool ruffled fabric trim that coordinates with the bag’s handle. Clifford’s profile graces the bag’s top, adorned with plenty of bling. The character and style of this go anywhere bag is a real show stopper. SRP: $20 each. The Satchel is available in the pink leopard print. Talk about style and design, this 9” wide by 6” tall bag is shaped in a half circle and is detailed to the nines. A very cheerful full faced Clifford graces the bag’s front, holding a blinged out doggy bone in his mouth. The bag is completely trimmed in pink cording that coordinates with the rounded double handles. The bag has a sturdy zipper closure. Girls watch out because mom may be trying to take this one out. SRP:$24 each.